Knock, knock! Who's there? Orange. Orange who? Orange you craving a creamy new concoction that combines orange and vanilla? This new sipper is AMAZING! Grab a straw, people. In a tall glass, combine powdered creamer and sweetener with 2 tbsp. very hot water; stir to dissolve. Add Trop50 and mix well. Transfer contents of the glass to a blender. Add all remaining ingredients and blend at high speed until thoroughly mixed. If needed, remove blender from the base, stir mixture, and blend again. Pour into the glass, stick a straw in it, and slurp away! Tangy orange with creamy vanilla is one of those combos that just works. Like saltwater and taffy, the flavors harmonize to make beautiful music for your mouth. The problem with indulging in this classic duo is that most of the shakes and smoothies featuring the beloved pair have crazy-high calorie and fat counts! Whether they're clearly loaded with fat or seemingly virtuous, you can easily and unexpectedly find yourself in nutritional trouble. Need proof? A 16-oz. 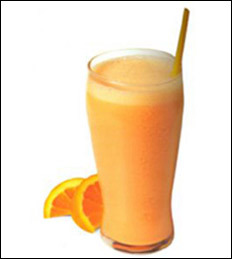 Orange Dream Machine from Jamba Juice has 350 calories and 71 grams of sugar. A regular-sized Orange CreamSlush at Sonic Drive-In has just as many calories PLUS 14 grams of fat... and the large version has around 550 calories and TWO DOZEN fat grams! Why take a risk when you can blend up a super-delicious, guilt-free version at home? 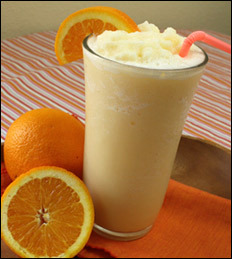 This tall glass of orange-crème fun is extremely simple to make, and it will keep you smiling all summer long. Blend 'n sip! Today, May 31st, is the last day of National Asparagus Month and the last day of National Strawberry Month. Click here for the nutritional 411 on both of the spring favorites, plus fun ways to enjoy 'em!